It’s been a while since I finished reading Yokohama Kaidashi Kikō. For those who don’t know, YKK is a sci-fi, slice-of-life manga by Hitoshi Ashinano. It was serialized in Afternoon magazine from June 1994 to February 2006 and collected a total of 14 volumes. YKK is the type of manga that is well-loved by some but is completely uninteresting to others. In case you’re wondering, I’m one of the people who loved it. I’ve been meaning to write a review for this series, but never quite got around to it until now, so here it goes. YKK takes place in a post-apocalyptic world in which the human population is in decline after an unexplained environmental disaster. Alpha Hatsuseno is an android who runs an out-of-the-way coffee shop near the coast. Alpha’s owner has gone on a journey of indefinite length, which leaves Alpha to run the coffee shop by herself. The manga follows Alpha through her activities including interactions with customers and the people who live nearby, shopping trips to Yokohoma (hence the name which roughly translates into “Yokohoma Shopping Log”), and journeys through the countryside. One of the most striking things about YKK is that it presents a very different version of the post-apocalyptic world than other stories. After the unexplained disaster, nature has reclaimed much of the landscape and the environment is lush and beautiful. Instead of fighting against the suddenly change or crying doom and gloom, people have accepted and reverted back to a simpler existence. Despite knowing that the future does not bode well for the human race, everybody tries to live happily and peacefully in this serene and beautiful world. Our protagonist Alpha is a perfect example of someone living in this world. Even though she spends most of her time alone and in the middle of nowhere, Alpha manages to lead a fun and fulfilling life because of her ability to discover the wonders of seemingly mundane activities. Alpha’s positive outlook on life is shared by many of the other characters, and this optimism and hope for the future is main theme of YKK. It is not that the characters are unaware or in denial of the current state of the world; it’s just that they have decided to live out their lives as happily and enjoyably as possible in spite of everything, and this is part of what makes YKK more than your average manga. Another often-mentioned aspect of YKK is its art style. Ashinano utilizes a very unique art style that is simple, fluid, and clean. The pen-and-ink drawing style takes a little getting used to, but after a while I started to appreciate the art’s cleanliness and simplicity. The lines just flow together really well and the pictures have a very natural feel to them. While you wouldn’t see heavy use of details and textures, the characters (particularly Alpha) have a wide variety of facial expressions which help to convey their feelings to the reader. Similarly to the characters, the background art might lack fine details, but it is successful in conveying the imagery of a beautiful and lush environment. The point is that while the art of YKK may not be the most intricate or detailed, it is very unique and appealing in its own way. Most of YKK is told in stand-alone, slice-of-life stories that feature Alpha or other characters going about their daily activities. Many of there chapters have little dialogue, and Ashinano instead chooses to let the pictures tell the story. All of the chapters are meticulously paced and very laid back. One chapter may be about Alpha experimenting with coffee, and the next one is about riding her scooter. This might sound really boring to some, but Ashinano has paced things slowly so the reader can follow Alpha along as she finds wonder and joy from seemingly mundane activities. In order to enjoy YKK, the reader also must take things slowly just like the characters. While most of the chapters are self-contained, there is continuity between them. As time passes, both the geography and the people of the world change accordingly and thus creating a sense of reality in what otherwise is a post-apocalyptic, sci-fi setting. This, along with the light slice-of-life stories, creates a down-to-earth feeling that makes it easy for the reader to visualize him/herself inside the world, and this is another reason why YKK is enjoyable to read. As mentioned by many other reviewers, there are quite a few mysteries in the world of YKK, and Ashinano never bothers to answer most of these questions. I believe this was the right thing to do, because it allows readers to wonder about the world alongside the characters, which increases the level of reader immersion. Besides, the focus of YKK is not about finding out what happened to the world; it’s about finding the happiness and hope in everyday life for which YKK has plenty of examples. Even though YKK is all about finding happiness and hope in everyday life, I can’t help but feel a little sad for Alpha. As her human friends grow old, move to other places and pass away, Alpha’s eternal youth becomes her biggest burden as she is unable to move through time with them. Even though Alpha has the ability to see the beauty in her surroundings, she is not oblivious to the fact that the people she has known for so long are leaving her behind. I suppose Alpha will always have Kokone for company, and she will probably make new friends as time passes, so the outlook on Alpha’s future still looks positive. However, the same cannot be said for humanity’s future in the story. The feeling of nostalgia and loss only serves to make the story even more magical, since finding happiness in a world in decline is probably more difficult than doing the same in a more ordinary environment. 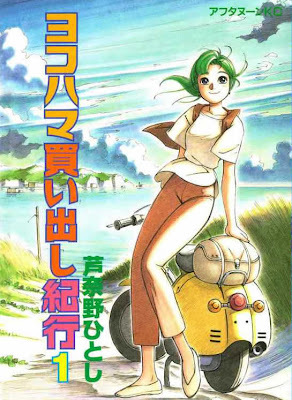 There is nothing I have said here that haven’t already been said in the various other reviews of YKK, but that’s the point: there is no denying that YKK is beautiful, both in terms of its story and artwork. YKK is more or less a must-read for those who are partial to slice-of-life stories, and it’s worth checking out for those who don’t especially dislike the genre. However, YKK isn’t really for those who are looking for mainstream action adventures or romantic comedies. The series has no violence at all and is inoffensive in general. There is a little bit of girl-on-girl romance, a drinking scene, and some mentions of guns which are never used because no character in the manga has any violent tendencies whatsoever. Basically, the message is that if you are looking for a manga that is light, meticulously paced, and gives you that warm and fuzzy feeling then you should definitely consider reading YKK. So that’s the review. Being a laid-back, feel-good slice-of-life manga, YKK is sometimes compared to Kozue Amano’s Aria, which is one of my favorite manga series. Comparing the two, I have to say I like Aria slightly better, although YKK is excellent as well. The main reason for this is just my personal preference: I like happy stories. Although both YKK and Aria emphasize the theme of finding hope and wonder, YKK has that thin layer of sadness due to the state of its world, while Aria’s Neo-Venezia is more or less a utopia. You could say that YKK is better because it has that hint of loss and nostalgia which makes it slightly more realistic, but I prefer my unambiguously happy endings.